As we head into the weekend, we’re only a few days shy of celebrating St Patrick’s Day on March 17th. A lot of us can claim Irish ancestry (hands up who can!) In my case it’s there by the skin of my teeth - a great grandmother who was part of the Irish diaspora in the 1800s. It’s a long way back, but she’s there and I’m clutching it. I got to thinking not so much about the day itself but about favourite Irish things and as we here at Sweet Romance Reads are romance writers, I’ve come up with some things that a fair few romance writers have in common. A love for music (we sometimes write our books to certain songs), books themselves (we love to read and write), and being romance writers – no prizes for guessing this one - men. So let’s talk. What are your favourite Irish things? I’ll get the ball rolling with my top Irish picks. Books. I’m going to choose everything by Marian Keyes. She writes women's fiction, funny and warm, and she even has a cake cookbook! What's not to love about that? And lastly, men. Out of all the actors, musicians, sports people, I’m choosing that Irish bad boy, Colin Farrell. I'm sure his picture is stuck up on a few writers' collages as hero material. So what about you. Agree? Disagree? What are your favourite Irish things? 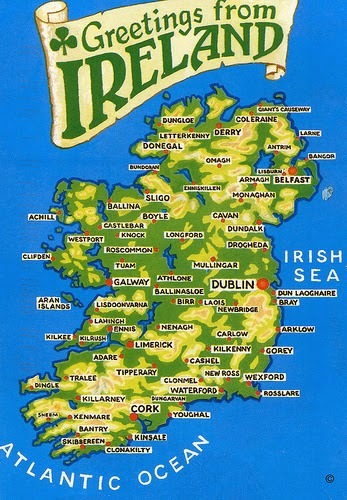 I've been to Ireland a couple of times and love the country. It is very much like England, green and wet! My favorite thing about Ireland is the mythology. I adore all the Celtic lore and myths and have used that in books in the past. I was going to say Gerard Butler is my favorite Irish thing, but he's actually from Scotland! I'm going to say music, because I do enjoy listening to Celtic Woman. Seeing Sneyd's monument, in Christ Church Cathedral's crypt, is one of my favorite moments in Ireland. ...Sneyd was murdered, and his effigy is worthy of a romance hero. Stunning. I also loved the Writer's Museum, the beautiful country, the lovely people, and...yummy...caramel squares, which seemed to be in every shop. We were there last spring, will be going to Scotland this year, and back to ireland in 2015. A few years ago my son had his DNA analyzed by FamilyTreeDNA. I found that the matralineal (my genes) are group I (capital I not L) which was the first group to migrate to the far north of Europe from the Middle East. I agreed that our DNA info would be available to anybody who matched ours and a few Irish individuals have popped up. BTW, my dh is a J2, the group that migrated from Mesopotamia on the northern & southern shores of the Mediterranean Sea and then upward into Spain and France. I don't know how much this actually means but it's helping map the human race. My ancestors came over from Ireland in the 1740's, but since our name is Forsythe, a Scottish name, I think Ireland was a stopover, so I can't really claim Irish heritage. I admire the fact that no matter what, the Irish keep reinventing themselves and surviving. The Irish Potato Famine in the 19th century? No problem, move to America and start over. Faltering economy in the 20th century? Okay, we'll go high tech. They just keep coming back. Up the Irish! I do have some ancestors born in Ireland, some having come by way of Scotland but others being native. I think loving all things Irish is in the DNA! Okay, I can't say all things. I hate corned beef and cooked cabbage. But I could live on potatoes and ale! Am jealous of those who have been!! Go the Irish, and Happy St Patrick's Day!!! I have some Irish ancestry. My maternal grandmother's maiden name was McGee. My mother-in-law was 100% Irish and very proud to be so. When she passed away, we inherited a lot of her Irish things. I love Irish blessings and Irish music. I think my favorites Irish thing is names, especially male names. Its funny because I saw that Christina Dodd ran a poll of masculine hero names, and she said that Irish names kept showing up on it. Celtic Woman. The Corrs. Wool sweaters, and my mom's best friend. Those are a few of my favorite - Irish - things ... but for all that, have never been there. Yet.